This back saw with a large saw blade is perfect for deep cuts in the direction of the grain, such as cutting mortise and tenon joints. 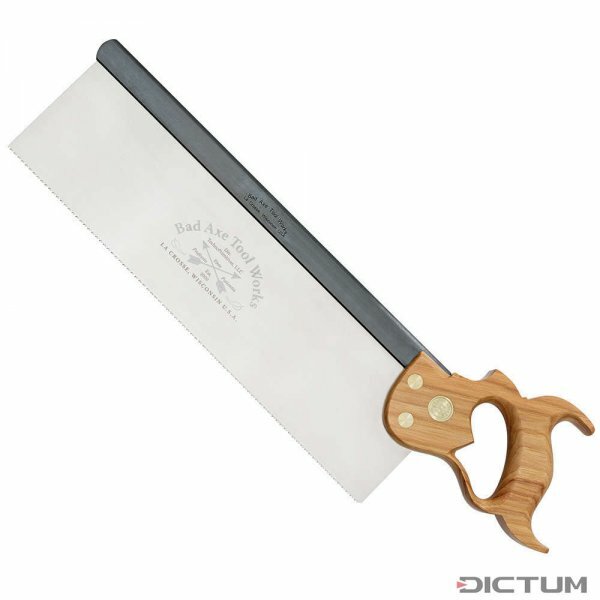 The very well-balanced saw with specific toothing cuts efficiently on the push stroke and without jamming up to a depth of 10 cm. Regular size = 91-98 mm hand size. 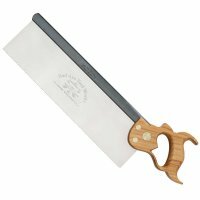 The hand-sharpened saw blade, made of Swedish spring steel, is attached to a gunmetal-finished steel back that allows it to be tightened or, when necessary, completely replaced. The hickory handles (different sizes available according to hand size) are secured with traditional brass split-nut screws. Bad Axe offers a lifetime guarantee on materials and workmanship! (Damage caused by improper use is not covered).